Twice the coverage of conventional single-agent systems Cools down cooking oils 15 times faster than wet chemical systems Flexible overlapping nozzle coverage for most appliance arrangements Smaller and fewer agent storage tanks required per system . 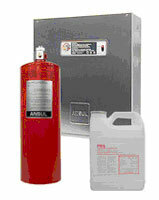 ANSUL K-GUARD Fire Extinguisher is 2-A: K rated, K CLASS restaurant fire extinguisher and meet NFPA 10. 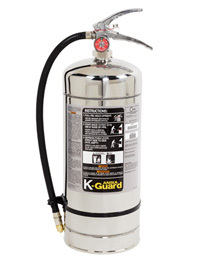 Rated for Class K fires, K-GUARD Fire Extinguishers are designed specifically to fight some of the toughest fires—hot grease, cooking oil and fat fires in the kitchens and food-prep areas of restaurants, convenience stores, food courts, hospitals, school cafeterias and other facilities. 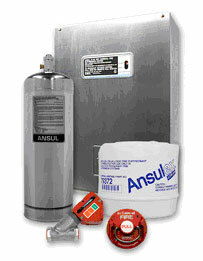 The ANSUL® R-102™ Liquid Agent System continues to be the #1 protector of today’s kitchen equipment. Choose from either of two design options… Appliance-Specific Design. The most efficient fire protection is accomplished when nozzles are selected and aimed at specific hazard areas on each appliance. This method typically provides the most economical use of liquid agent reducing the size or quantity of storage tanks and associated hardware. Overlapping Appliance Protection. When flexibility and simplicity are most important, nozzles are placed in a straight-line arrangement providing overlapping agent discharge patterns. This creates a virtual fire-free zone where appliances of various types and sizes are protected - even if they are replaced or rearranged under the hood. THIS IS BIG! ANSUL® R-102™ Overlapping Applicance Protection has EXPANDED. Greater spacing between nozzles and simplified piping guidelines are just two of the many enhancements now offered. When flexibility and simplicity are the most important features for a kitchen design, ANSUL Overlapping Appliance Protection provides a virtual zone of protection where appliances of various types and sizes are protected – even if they are replaced or rearranged under the hood. Nozzle Spacing – Expanded from 12 in. (305 mm) to 25.5 in. (647 mm).